Religious tracts: they’re not just for Jack Chick anymore! Even fake religions like Roboreaganology can get in on the act. Praise Capitalism! You can download this tract as a PDF, so that you can print them and start promoting Chainsaw Buffet for us wherever you go sowing the seeds of chaos wherever you go! 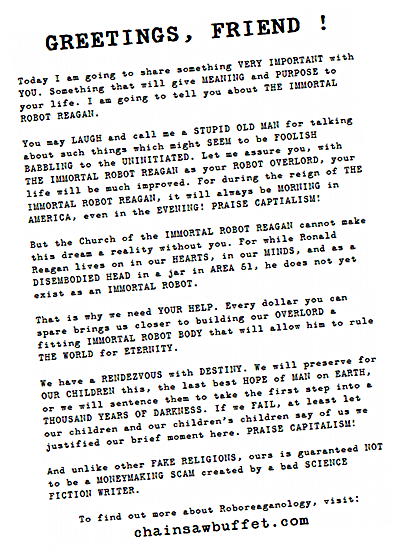 Posted in: The Church of the Immortal Robot Reagan on January 21, 2008 by The Maitre d'.